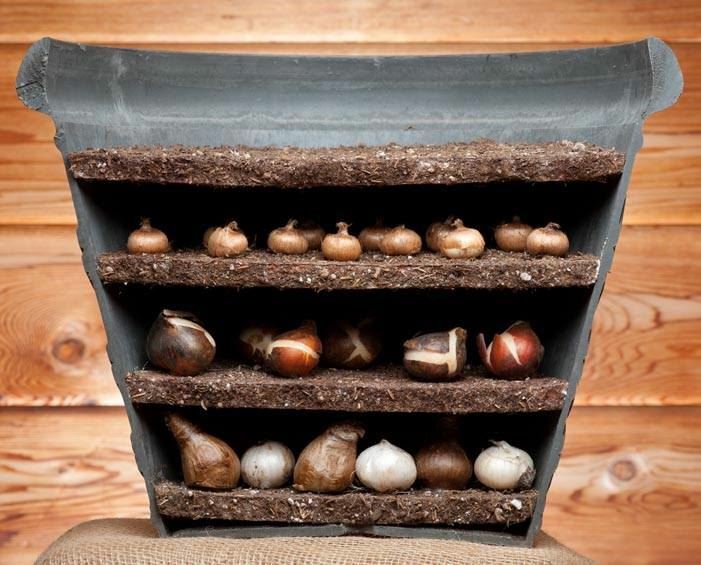 If you are short on space, or prefer spring bulbs planted in pots and containers, this method of layering bulbs will give you maximum impact over the spring months in minimum space. Simply choose your container – it will need to be fairly deep. Put a layer of gravel, broken crocks etc. to aid drainage, then a layer of compost. Then add tulips, they can be fairly close together but must not touch each other or the sides of the container (this applies to all layers). Now cover with compost and then add a layer of daffodil bulbs. You could have one or two varieties, maybe one early like Rjjnvelds Early Sensation, and a later one like Cornish Pride or Finland. Then cover this layer with compost. You can now add smaller bulbs, like Crocus, Iris Reticulata, Chionodoxa, Puschkinia or Scilla Siberica. Look at the flowering times and work out a plan so that you have flowers in the container from January – April/May. You can search different varieties by flowering times on our website now, so it couldn't be easier - or try one of our bulb collections, the Spirit of Spring collection, the Spring Pastels collection or the Sunburst Collection would all work really well in a layered pot. Remember that all bulbs planted in pots will need frost protection during cold weather - either move them into a garage or insulate it with a layer of bubble wrap or hessian.